Are you looking to repair your pavement or just a little touch-up? Well, you have come to the right place. We are one of the most reliable, quality oriented and trusted parking lot maintenance companies in Indiana. With several years of experience in this field, we offer a wide range of parking lot services at unbeatable costs. We understand that parking lots and paved areas have been labeled high maintenance in the property market but this shouldn’t be the scenario. From Parking lot striping, asphalt repair services, seal coating to pavement stencils and concrete repair, our commitment and pride is to continuously push to be the best in the industry through our work. As the pavement ages so does the asphalt binder leading to pavement deterioration. We offer parking lot maintenance services at the most affordable rates in South Bend, IN. Our past clients have given testimonials that our parking lot maintenance services actually can last their pavements in good shape for a minimum of 2 years. The difference between parking lot maintenance costs lies in the keenness an owner or manager has on their parking lots. Asphalt parking lot maintenance guidelines should begin from the first 5 years of installation. A continuous assessment of an asphalt pavement is mandatory if you want to prevent huge damages that could be too costly to repair. Asphalt maintenance is the key to a longer shelf of your pavement.As a facility owner or day to day manager, protecting your pavement starts with having a plan. The most basic approach is crack filling which reduces the infiltration of water into the crack thus protecting the pavement from getting weaker as a result. A good parking lot maintenance program will ensure they keep the water out of the cracks early enough. We also offer seal coating services which, as the name suggests, seals the top of the asphalt pavement to protect it from the damaging of infiltrating water or extreme weather condition that may further widen the cracks. 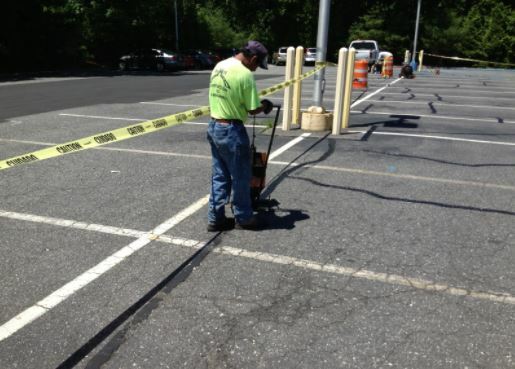 As a company, we offer a preventative parking lot maintenance plan to reduce further deterioration of your parking lot.